Reply is a cloud-based lead management, email prospecting, and sales automation solution which can be used for inbound and outbound sales, recruiting & HR, business development, fundraising, and more. The system is designed to allow users to contact a large number of prospects automatically, while still making each email appear as if it was sent personally. Reply includes a campaign wizard through which users can create and manage multiple email campaigns. Users can add steps to create a sequence of outreach and follow-up emails, customize the subjects and body text of messages, schedule emails to be delivered at peak hours, and select contacts to be included in the email list, before reviewing and launching their campaign. Contacts can be added from imported lists, or identified within the app itself, with users able to create ideal prospect profiles and search for contacts based on a range of values from within these profiles, such as company, title, experience, and more. Reply also offers automatic response classification, sorting responses within the inbox according to their content. Users can view how many respondents are interested or not interested at a glance, and can customize the way responses are sorted by renaming the email statuses. Outbound emails can be tracked, giving users insight into delivery, open, click, and response rates, as well as any bounced emails and ‘Out of Office’ replies. Email copy can be A/B tested to optimize campaign performance, and reports can be delivered to users’ inboxes daily, weekly, or monthly. We started using Reply a few weeks ago and the ROI is obvious. $70 for 1000 contacts and we DOUBLED our monthly sales. The app is fairly intuitive and can be learned quickly. The support team is really responsive for any questions that do arise. It's been an awesome experience so far and we're looking forward to buying more contacts as our sales team scales. However, we haven't had the need to scale yet because Reply allows each member of the team to 10x their efforts!Increase your productivity: set your campaign and forget it. Add bulk contacts or add contacts as you need. You can send 10 emails with the effort of sending 1. Does away with manual data entry tasks (a godsend for any sales rep using antiquated CRM software!) Simple to use. Easy to build campaigns and add contacts to them. Very helpful for sending targeted messaging to prospects. It just works. Emails look slick and they're completely personalized. Zapier integrations work really well. For example, you can set a Zap to stop sending emails to a prospect when they 'close' in your CRM, ensuring there is no overlap in communication. Increase your productivity: set your campaign and forget it. Add bulk contacts or add contacts as you need. You can send 10 emails with the effort of sending 1. Does away with manual data entry tasks (a godsend for any sales rep using antiquated CRM software!) Simple to use. Easy to build campaigns and add contacts to them. Very helpful for sending targeted messaging to prospects. It just works. Emails look slick and they're completely personalized. Zapier integrations work really well. For example, you can set a Zap to stop sending emails to a prospect when they 'close' in your CRM, ensuring there is no overlap in communication. Very little dislikes at all. Maybe some small tweak to the UX or some reports I only look at infrequently....but definitely nothing material. We use Reply.io for following up our website leads. We have tried several instruments (SendGrid, MailChimp, HubSpot emails) before switching to Reply.io and so far it was the best instrument. Our response rate has increased by almost 10% due to Reply.io. - because there is not a lot of HTML involved in the formatting of the email, the letters get directly into the inbox (unlike Promotions or Spam), which is the main benefit of this emailing instrument. - it's convenient to create email chains and track notifications and responses. - there are team plans for collaboration and you can see the activity of your colleagues, which helps a lot when you need to create statistics for the marketing department. - because there is not a lot of HTML involved in the formatting of the email, the letters get directly into the inbox (unlike Promotions or Spam), which is the main benefit of this emailing instrument. - it's convenient to create email chains and track notifications and responses. - there are team plans for collaboration and you can see the activity of your colleagues, which helps a lot when you need to create statistics for the marketing department. Pricing is based on the number of people contacted per month, and is billed on a per user, per month basis. Pricing for individual users starts from $50/user/month, paid monthly, to contact 200 people per month. 20% discount is available for annual payments. What you'll get: 3 user licenses included, $70 per additional user, Contact 30,000 people per month, Team Edition, All features included. What you'll get: 5 user licenses included, $60 per additional user, 10K email validations included, Team Edition, All features included. What you'll get: 10 user licenses included, $50 per additional user, 20K email validations included, Team Edition, All features included. Users can search for prospects’ contact information directly within Reply using a range of values from their ideal lead profile, including title, company, experience, and more. The built-in campaign wizard allows users to define steps, customize messages, schedule email sending times, add prospects to email lists, and more, to create automated email campaigns where the emails and follow-ups appear to have been sent manually. Responses are automatically sorted into folders based on their content, giving users an at-a-glance view of how many responders are interested or do not wish to be contacted again, and email statuses can be customized to change how responses are sorted. Team members can collaborate in Reply and share contact lists and email templates, with administrators able to control the role and status of each team member, and divide campaigns between users. Email delivery, open, click, and response rates can all be tracked, as well as any bounced messages and Out of Office messages, and users can A/B test email subjects and body text to optimize performance. Below are some frequently asked questions for Reply. Q. What type of pricing plans does Reply offer? Q. Who are the typical users of Reply? Q. What languages does Reply support? Q. Does Reply support mobile devices? Q. 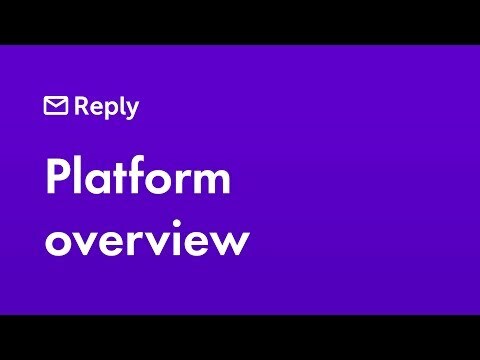 Does Reply offer an API? Yes, Reply has an API available for use. Q. What other apps does Reply integrate with? Q. What level of support does Reply offer?